Dear Friends. I am Wg Cdr Baljit, an officer of the Indian Air Force. I wish to inform you of a incident that has happened with me during transportation of my vehicle from Chennai to Delhi on transfer, resulting in a damage of Rs 5 Lakh. I had handed over my XUV 500 to M/S New Delhi Packers and Movers on 25 Apr 18 in Tambaram, Chennai. It is run by Mr. Ram Dhari Sharma who initially claimed to be a seemed reliable and soft spoken man. There was no damage on the car when it was handed over. It was to be delivered to me on 4 May 18 upon my arrival in Delhi. 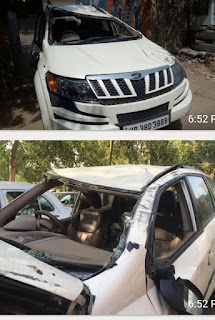 When I reached Delhi I got a call from the rep of transporter that my car has met with an accident resulting in complete roll over and the damage is extensive. I was shocked. Apparently my car was offloaded in Faridabad on the night of 3 May 18 and was being driven to Gurugram by the company driver Mr Sandeep. He was driving the car at high speed and lost control hence the car overturned. Fortunately the driver was safe with minor superficial injuries and nobody else got hurt. On my communication to Mr Sharma he was also shocked, however, he assured that the car will be repaired and handed over without any cost to me. The car is in Sterling Motor Co at Gurugram undergoing repairs. The appx bill of repairs has been estimated at Rs 5 lakh out of which Rs 1.8 Lakh is customer liability after the insurance claim. This was amply communicated to him and he assured that it will be looked after. We have been in regular touch on a daily basis. On 29 May 18 I informed Mr Sharma of the progress of the car repairs along with pics and asked him to arrange funds after which he is absconded. He does not pick up any call and has blocked his Watsapp. The scoundrel has run away. Here are some pics of my car and his face. PL BE AWARE AND BEWARE.